Our�previous* boat was called "Kahawi" A thirty foot Freeman motor cruiser, she is number 26 of only 100 built by John Freeman of Hinkley in Leicestershire around the late 60's and early 1970's. With four berths in two cabins and twin six litre diesels under the bonnet, we loved her to bits! For River use, she is ideal, low freeboard for the constant 'locking' up or down river, twin engines and she handles like a dream. She is certainly quick enough for the occasional jaunt into tidal waters. We have taken her round to Rochester on the River Medway, up the East coast to Woodbridge and under previous owners she had spent a lot of time in the European canal system as well as making numerous channel crossings. Running on one engine, we use about 3/4 gallon of diesel per hour, very reasonable, it's only the wine that costs so much! Being an avid "Inter-naut" I set up an Email address for her. It then seemed logical to create a sub-directory under my Business WebSite which became "Kahawi" and so the Site name stuck. Many years ago I lived on the River Thames in an ancient wooden ship's life-boat conversion. Being around water must have got into my blood, I am sure the smell of paraffin, wet and dry rot are still with me, anyway! A few early cruises on the East Coast around Aldeburgh - One marvellous cross-channel voyage as crew on the Malcolm Miller, a Sail Training Association schooner. Much drinking ( sorry sailing ) around the Solent, the French Coast, Alderney etc. and we were both well and truly 'hooked' on boating. We kept Kahawi on the Thames at Maidenhead, well inland of course, but this had the benefit of being only 10 minutes drive from home. Consequently we used her almost all year round. It is actually simpler to cruise down and moor up at Windsor for a few hours shopping, than it is to drive a car there. It is certainly more enjoyable! 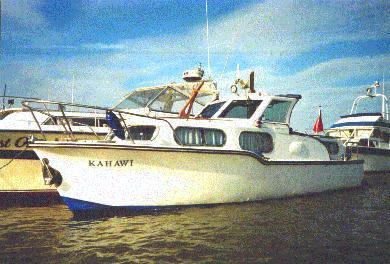 * In August 2002 "Kahawi" was sold off, along with our car(s) house, etc. in readiness for "Sailing away":- Please take a while to read the rest of our Web-Site to find out why and what we are currently up to! Visit (or Join) the Freeman Boat Owners E-Group here!